I have analysed the lap times chart topic in this forum and tried to find various pair of cars which are similar in terms of performance and are low-cost (both or one of the cars which belong to the same pair), so that newcomers to Simraceway have more races to choose from. Please let me know if there is anything I can improve in any of the previous configurations. I would replace the 8C with the Dodge Charger R/T. The Dodge seems to have a similar performance but is a lot cheaper (300cr vs. 2410cr). I don't know if we could have some trouble when putting all cars together because of that bug in mutli car races. If however that's possible, then we would have to choose groups of cars which are balanced in terms of performance on track (for example, a S5 would easily defeat the GT86 and RX-7, which is a little bit unfair, in my point of view). Anyway, looks like we have the Megane RS va Evo X race which I suggested. I have been playing it and it looks like both cars are a good match for each other. What do you guys think? Thanks for coming up with these requests - they are all well throught through and making a nice fit in the whole environment. I plan to put them all live today and then we'll see what next. This is where opinions about them shared in this thread or on chats will play a role, so keep them coming! Thanks for the feedback. On the following days, if you want to make them all live, it would be just a matter of choosing a similar track for each pair or another possibility is to choose one or two pairs to be run on each day or two in two days or something like that. Also, what do you think of creating another topic similar to this one, but with cheap and reasonably fast cars and another topic with faster street cars like the Lexus LFA, R8 GT, etc? With regards to the GT86 vs the RX-7, the RX-7 is a little bit fastar on a straight line, but it tends to be more tail happy than the GT86, which menas they got at the same time to the finishing line. Speaking of the MX-5 vs the Beetle Turbo, both cars can keep up with each other, so I wouldn't touch this combination. The only proposal I have some doubts with is the RX-8 vs the Evo X. 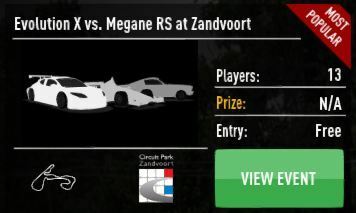 The Evo X is way faster around the selected track, so perhaps we should swap the EvoX with the RX-7 or for example the Supra, which is also RWD. What do you think?